Today is the last day of July which means it’s the last day to use code ‘July’ to get The Rising for only $1.50 right here. If you don’t have it, this is the perfect time to get it. Graveyard Calling, the label releasing the ltd edition cassette of The Rising in November, has its first TWO releases out today. Check out graveyardcalling.co.uk to order Tommy Creep’s “Vacant Tombs and Full Moons” & Ghoulshow’s “Tales From the Netherworld” before they’re gone. Only 30 of each are available. For those of you chomping at the bit to get the cassette release of Werewolves in Siberia’s debut, The Rising, it’s looking like a November release. Wondering what will be included? Graveyard Calling Records has stepped up to make sure it’s a collector’s item. 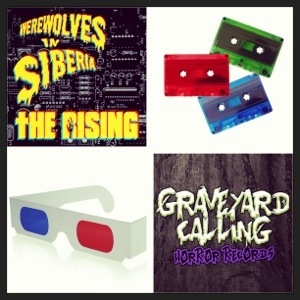 The cassette will include 3D art, old school red & blue 3D glasses and a plethora of Graveyard Calling bonus items. This will be a very limited run so make sure you keep your eyes open this November. And don’t forget, August 19 will see the release of Graveyard Calling’s Bat World Sanctuary comp cassette. All proceeds will go to Bat World Sanctuary AND every horror track on this comp is exclusive to it, including the new WIS track, The House of Nosferatu (see previous post about limited edition t-shirts). The Rising was listed as one of the top 100 releases of 2013 so far by the UK’s Louder Than War. You can download it here the rest of July for just $1.50 with code ‘July’. Then, head over to iTunes and give it a review/rating. Also, make sure to add it to your Spotify playlists. WIS makes Louder Than War’s Top 100 albums of 2013 so far list! The UK’s Louder Than War site has posted their list of top 100 albums of 2013 so far. As I happened to skim through the list, I noticed “The Rising” had made the list. Pretty shocked and pretty stoked about it. Take a look for yourself. In addition to now being on iTunes, WIS is now on Spotify as well. Add it to your playlists and rock out to The Rising aover and over! Click the image to link directly to it. Every Friday, 6 Ft Plus does a new horror podcast. In this week’s episode, WIS’ “The Hunt for Humans” is on it. Check it out. Tons of fun horror artists to listen to (Gov. 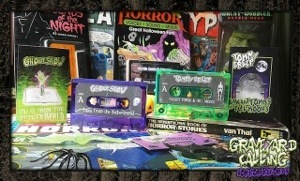 Grimm and the Ghouls, The Groovie Ghoulies, The Howling Bullets and Blitzkid, to name a few) and some cool horror news as well. Click the image to check it out.